Kyle Funkhouser does not have any MLB stats for the season. Draft: 2016, Detroit Tigers, 4th rd. Resides in Oak Forest, IL during the offseason...Recommended/signed by Harold Zonder for the Tigers. Combined to make 19 starts between Double A Erie and Triple A Toledo in 2018...Named to the Eastern League Midseason All-Star Team... Allowed two earned runs-or-less in six consecutive starts from June 6-July 3, posting a 4-1 record with a 1.34 ERA (33.2IP/5ER) and 34 strikeouts...Sidelined from July 24-September 14 with a right toe fracture. January 22, 2019 Detroit Tigers invited non-roster RHP Kyle Funkhouser to spring training. September 14, 2018 Toledo Mud Hens activated RHP Kyle Funkhouser from the 7-day injured list. July 26, 2018 Toledo Mud Hens placed RHP Kyle Funkhouser on the 7-day disabled list. July 10, 2018 RHP Kyle Funkhouser assigned to Toledo Mud Hens from Erie SeaWolves. March 30, 2018 RHP Kyle Funkhouser assigned to Erie SeaWolves from Lakeland Flying Tigers. February 25, 2018 RHP Kyle Funkhouser assigned to Detroit Tigers. September 8, 2017 Lakeland Flying Tigers activated RHP Kyle Funkhouser from the 7-day disabled list. June 19, 2017 Lakeland Flying Tigers placed RHP Kyle Funkhouser on the 7-day disabled list retroactive to June 15, 2017. May 17, 2017 RHP Kyle Funkhouser assigned to Lakeland Flying Tigers from West Michigan Whitecaps. April 1, 2017 RHP Kyle Funkhouser assigned to West Michigan Whitecaps from Connecticut Tigers. 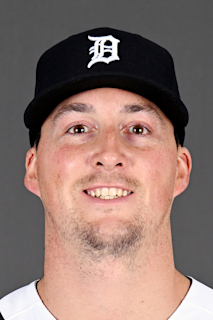 June 26, 2016 RHP Kyle Funkhouser assigned to Connecticut Tigers from GCL Tigers West. June 24, 2016 RHP Kyle Funkhouser assigned to GCL Tigers West. June 23, 2016 Detroit Tigers signed RHP Kyle Funkhouser.